What an exciting day for a giveaway! Today we are sending you to a magical land far far away to see something spectacular. Okay, maybe not SOO far away but definitely magical. We are so excited about what Sew4Home is doing with our new Half Moon Modern fabric line and we can’t wait for you to see it. They will be featuring a fabulous new project to give you a bold & beautiful sewing room everyday through December 16th! Click here to head over to their site to see the gorgeous curtains they are kicking off the season with! Today we will be giving away one layer cake of Half Moon Modern! The winner will be announced tomorrow morning. 2. Stop by the Sew4Home website and show them some holiday love!!! 3. Leave one COMMENT on our blog as to why you want Santa to bring you this Stocking Stuffer and what you would make with it! So I could make a straight line. I want Santa to bring me this layer cake because I’m in love with fabric. I always need more to realise all my crazy ideas ! I don’t know if I need to leave another comment, but I’m already following your blog ! I adore Sew4Home, and I am loving this Half Moon fabric! I would use the layer cake to sew a pennant/bunting banner for my teenage daughter’s room. These colors would match her room perfectly! I love that line with the scissors and the chevron print. I would make some curtains for my sewing room. I love the colors too. I would use this layer cake to make a cozy throw. Love this Half Moon fabric! I would love to make a bag out of this fabric so I hope Santa puts this in my stocking. I would love to make a bag from this fabric. I follow this blog. I would like to see this in my stocking because it has a lot of the colors I am using to redecorate my kitchen. I am a new follower of Moda’s blog, what a great place! I am a follower of sew4home, love love love! There are two projects I’ve been eying, using layer cakes. I’d either have to narrow it down, or get another to do both! I would love to make some patchwork placemats and napkins with a half moon layer cake. I am eagerly awaiting this line as it brings back some of my favorite fabrics. Love those scissors! I would love to find this in my stocking because I don’t have a layer cake and really want one! I think there are so many things I could make with it. I like to make totes and aprons so that would be a start. Layer Cakes are the best! I’ve been using them alot lately to make baby quilts…but with this fabric line might have to make something for myself????? Scissors, butterflies, pretty colors, hmmmm, I can think of several projects that this fabric would work for! I LOVED this fabric in the black/white combo and it’s really nice in the colors too. I would love for Santa to leave me a layer cake of this to combine with the black/white to make an awesome quiilt. Love, Love, Love this fabric. I have the perfect table runner pattern. I haven’t dipped my toes into any cute,new, modern fabric yet – this would be a great way to start! My first thought was: I would just sit around and snuggle it. But I guess some sewing would be in order first. So – first I would sew it, then I would sit under it on the couch watching a sappy movie drinking coffee. Or Bailey’s over ice. In any case, you can be darn sure this one would be staying at home with ME! Love this fabric and the patterns. I am moving to a new house soon with my very own sewing room (YAY) so I would love to make something for my new space! I would love to have this layer cake. The fabric is cute. I have a pattern for a sampler quilt that uses a layer cake, but I don’t have any. I had no idea there was another set coming of this line, I love it!! I’d like it in my stocking because It’s a really cool fabric line. I’d use it to make wristlets for gifts. I subscribe to SEw4Home, and it is a great site. I love precuts and layer cakes are great. And I have several layer cake patterns that I haven’t tried yet! I love the butterflies and other modern prints! I want to win because layer cakes are fun to work with. I love fabric and would make pillows, pillows pillows from the layer cake….oh what fun! My parents-in-law celebrate their 60th wedding anniversary on Christmas Eve. I’m making a lap throw sized quilt for their gift. This would be perfect! I am a follower at both places 🙂 I would love to make a lap quilt for my sewing chair! thanks Santa! I’m thinking a senior lady quilt for the nursing home – maybe a lady who once liked to sew. Oh my gosh, love this fabric line:) I would make my sewing machine cover and a few pillows for my sewing room!!! I logged in at the Sew for Home website under CharityStitcher. Love those curtains! Once again, I “loved” Sew4Home. The fabric is beautiful. Would love to find this in my stocking. Oh, love this layer cake. I think I would use this to make a throw quilt for my daughter and her roomies at college. Their house has no particular color scheme as they get whatever strikes their fancy at the time. The variety of colors would be great for them! Love the fabric and love pre-cuts! Thank you for having the 12 Days of Christmas! I,ve purchased new curtains for every room of the house except my sewing room because I have wanted to make my own for this very special place . I’d love Santa to put this in my stocking for a lap quilt! I am seeing purses when I look at this fabric! I would love to win this layer cake. I see a nice cozy quilt in my future. A layer cake of this gorgeous fabric is the perfect stocking stuffer – I would make patchwork sewing journals for me and my quilting friends! I love this layer cake…it will be part of my tree skirt! Hmm – thought I had already written something here about my desire for this fabric but can’t see it……..
You see, I need it SO much to make some prezzies. Yes~ love this fabric line!! CUTE! I think this layer cake would make an adorable quilt. Thanks for the generous giveaways! I love on Sew4Home’s site too! I’ll never have time to do! go make curtains for my new studio! I would use the New Moon layer cake to make a cover for my sewing machine and a thread catcher for my armchair. I deserve it in my stocking because I’ve been a good girl! I follow you and am on sew4home’s email list. I’d make a sewing machine cover for my DD with these fabulous fabrics. Thanks! I would make a new sewing machine cover. Mine is falling apart and this fabric looks perfect for it. ok got a little too excited there! lol heading over to show Sew4Home some LOVE too! I would love to win and make a cozy quilt for my sew/guest room. Happy holidays! That is just the coolest, most modern fabric! I would love to have some to make my granddaughter a cool quilt!!! I would attempt some curtains! I love the colors and the prints, especially the scissors! I would love to make some throw pillows and a cute knitting bag. i LOVE the colors and patterns – great line – would make an awesome sewing machine cover and placemats !!! Sadly I am a fabric addict, and I love this line. i love the colors and all the prints. would make a good rainbow quilt. Ok, I’ll tell you what I’d do with the fabric but Santa already knows because I have been telling him for days. 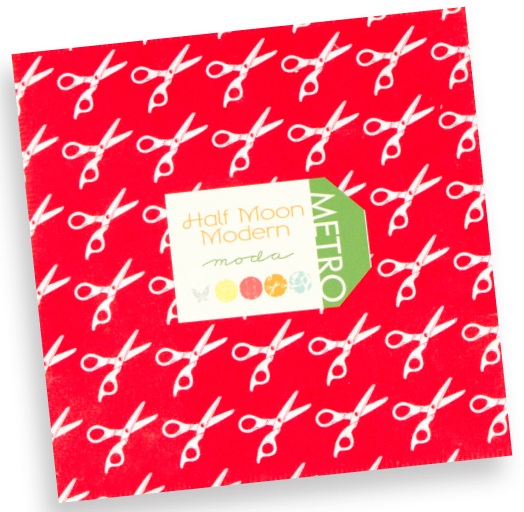 I have been saving a layer cake pattern for the perfect fabric and Half Moon Modern will work. One layer cake is enough to make a quilt using each fabric as a focus square. I would want to make some kind of a fun, fresh, and funky quilt. Love the colors. I would love to use it for a wall hanging in my sewing corner!! I would love to find this in my stocking. I would make one of the upcoming projects for my sewing room by sew4home. I love the curtains they show today. I have a Scribbles book and I need a layer cake for a quilt. I would love to find this in my stocking because it’s so darn cute. I made my first quilt with layer cakes and discovered how wonderful they are to use, so would love to win this pack to make a quilt. Thanks! Lana D.
Humm… after reading the sew4fun blog, and seeing the phrases clever organization and clearing the clutter, I think I would make some organizational things! I look forward to checking back with the sew4fun blog! Don’t you love the Sew4Home blog! I have found so many useful & fun items to make there. And of course if Santa were to leave that layer cake in my stocking so I could finish in my sewing room, it would be wonderful! Another great fabric to make more fun projects. Layer cakes are especially good for hot pads and table runners. Would love to win this, my sewing room needs brightening up so I would make a wall hanging for my sewing room. Oh I could definitely use this! Love all the colors and it would make a perfect holiday mini quilt to cuddle up under. i can see new shower curtains from the dots… with the other fabric as trim and itebacks! I’d love to win this because Oh My Goodness THOSE SCISSORS. I’d probably take that specific layer and make a zippy bag. Not sure about the rest of the cake yet. 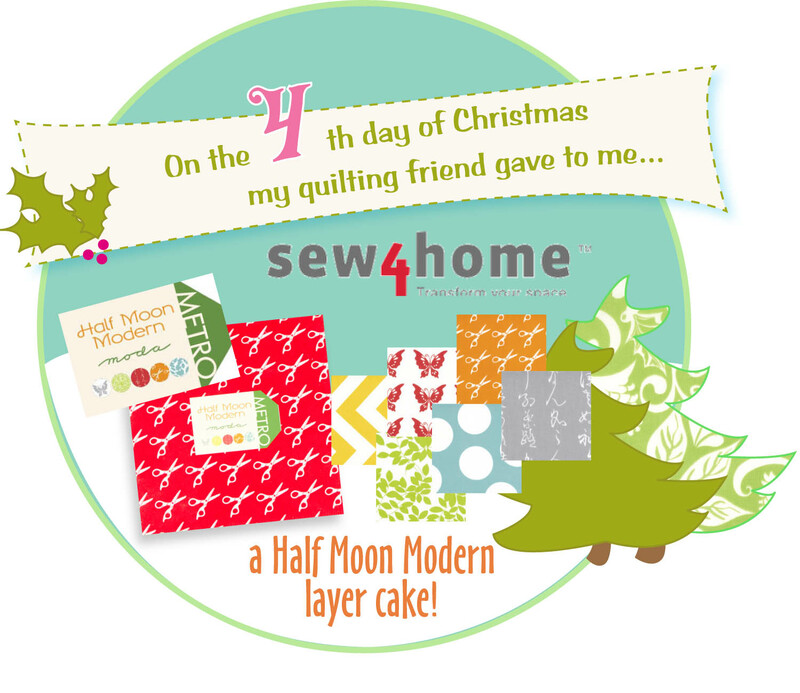 The Half Moon layer cake would be great to make sewing room accessories as gifts for my quilty friends. I LOVE this new line! Especially the chevron print. So awesome for a summer quilt or sewing room accessories! My husband has been bugging me about making new curtains for the living and dining rooms. I love the designs! I would use the layer cake to pick out the fabrics for our new curtains. This needs to be in my stocking because I have a huge love for fabrics and these are fabulous! I would probably leave them untouched for awhile before finally making a cozy quilt for myself! I’d LOVE to win this and find it in my stocking ! I’d make some Christmas gifts ; carry along list & note holders ; tissue covers ; zipped little bags ; oh I could go on and on . Or I may give it to my sister for a gift since as encouragement to do more sewing projects !!!! thanks for the chance to win !! Yep, I’m a follower here since quite some time. I went over to Sew4Home and that certainly made me drool. I didn’t need a kick in the b…. to comment there LOL. Most of my fabrics are reproductions, but I added some bright fabrics and love it. So this fabric would make it possible to make a modern quilt in radiant colors, so good for the dark winterdays. What cute prints. I would make some sewing bags for gifts with those scissor prints! I left a comment at sew4home! I would love to win this layer cake! I’d make a lap quilt to snuggle under now the weather is getting colder! Pillows, I would make some incredibly modern pillows! 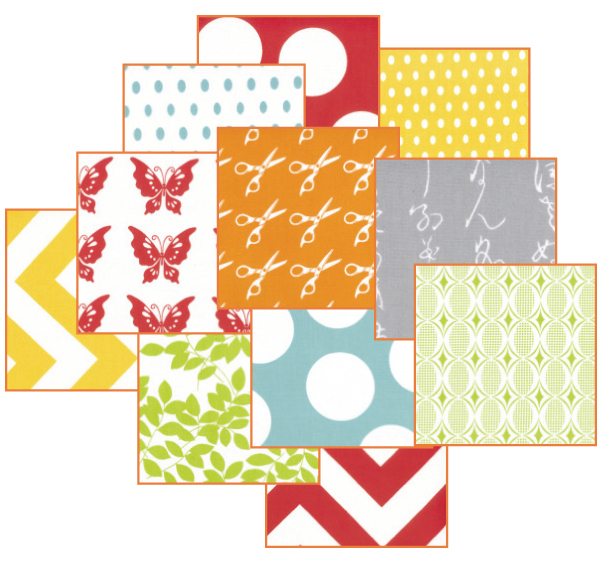 I love the fabrics and so would my quilting friends if I made their presents with these precuts. Hoping to win this layer cake. It is time to re-do my sewing room and this fabric and great colors would be grand. Thanks for a chance to win. Because I love that fabric and might actually make something for myself with it! Love the curtain project on Sew4Home and have added it to my reader so I can see all the projects – Thanks for introducing us! Love layer cakes and this collection is awesome. I’ve got a friend who would love a throw made out of this, it would go great in her LR. I am following on Facebook. I would love this fabric for bibs, burp cloths, little zipper pouches and coasters. What beautiful fabric. I would be making an apron for craftin/sewing. Lots of other ideas will pop to mind though if I find this in my stocking! Happy holidays! I would make lot of cute zipper pouches with this adorable fabric! Thank you so much for the chance at winning! I think if Santa would leave this for me I could use it to make some small gifts for friends (an early start to next year). I love this fabric group! My sewing machine and her sister, now two of them, really need new jackets! The one they wear now is from 1985….oh my!!! I’d stitch the layers together and make aprons for my daughters and granddaughters. Even the 3-year-od is learning to sew! Sew I can sew sew sew lol! I follow your blog… and if Santa brings that layer cake to me – I could make gifts for all his elves! The layer cake would be perfect for the Pom Pom throw featured on the Sew4Home page. I would make it as a gift for my quilting friend! Just love that scissor print! Fun fabric–I have a lot of layer cake patterns that would look great with this fabric! I want Santa to leave me this gift so I can spruce up my sewing room. It is very neglected and new fabric from Moda will inspire me to make the room pretty. I would want this in my stocking so i could make a tablerunner out of it! This would make a cute quilt for the sewing room. I so need this layer cake in my stocking to add to my stash and make more quilts. thanks. i am a follower and a fan. thanks. I need this as my craft room is a disgrace and definitely needs new curtains for a start! What pretty print. I love them!! I would love this cute fabric to make some project pouches it give it my sewing friends. I have not tried a layer cake yet and this looks like a fun one to try! Hoping I win! soo many of my favorite prints is such wonderful colors! would be fun to create something with these! Gorgeous fabric is always welcome. Would love to play with this line. I’d like to add this fabric to my stash. Beautiful! The fabric lines just keep getting better and better. I want (and really need) to sew for my sewing room and this would be just the best head start. I follow you and Sew4Home. Thanks. Love this fabric. I would make a pincushion and two thread catchers~~~~~ one for my sewing room, and one for my sewing chair in the living room. First of all, I would be “Over the Moon” and secondly,I can see colours and prints that would be useful for a quilt I am collecting fabric for at present, so thanks for the opportunity. Beautiful! Fabric designers are fantastic! Oh my gosh! I looooove this fabric! Those prints are so fantastic. Loved Sew4Home’s website. Had not seen it before now. Love this bright and cheerful fabric. I want Santa to leave this fabric under the tree for me because I have been a very good quilter this year. I am a new quilter and I see so many projects I want to make but I do not always have the fabric. This would make a beautiful addition to my collection. I want this for my stocking Santa dear, because I have recently discovered how much you can make with a layer cake. Thanks! Santa can leave this package at my house because I don’t have anymore layer cakes to sew with. I want, want, want this to make patchwork curtains for those bare windows in my studio – it’s awesome! Wow – let’s see… I love dots & I love aqua & I love butterflies… I MUST make something with this layer cake! I’m just discovering the versatility of layer cakes. These fabrics would probably find themselves all over my new studio as pillows, curtains, pin cushions, etc. I would love this layer cake as I am in dire need of a new quilt for my king bed. Santa can bring me Moda fabric any time. Would love the challenge of using the scissors and butterflies together — but love the geometrics most of all. I love the colours of the new fabric line. I would definitely start sewing with this fabric by creating a cover for my sewing machine, followed by a valance for my sewing room window and maybe some wall art, too! I keep sitting here trying to think of something clever and all I can come up with is “I just want it.” It would be so great to have. Love the scissor print! Thanks so much! I’d made their patchwork pompom throw with the minky center! It would look great with this fabric. Thank you! I would like to have Santa leave me the Half Moon Modern layer cake to use to make a patchwork sewing machine cover for my machine. So nice and bright. I would love this layer cake to make a quilt,,,,just for ME! Great fabric and a great blog. I’m not sure what I would make. Maybe some gifts for my friends birthdays. Layer cakes are so good for zipper pouches. Love the collection. I think I’d have to finally make a sewing machine cover and I’d better make a matching one for the overlocker. Gorgeous fabric!! I’d like Sana to bring me FABRIC and more FABRIC.. bury me in it.. so I can roll around in it.. ahhhh! I am getting EQ7 from DH for Christmas, so I would love to be able to make some of the quilts, and table runners that I am planning to design to my hearts content! I can’t stop thinking about it already.. knowing it is there taunting me in its little box. Oh I have the perfect quilt pattern for this wonderful fabrics. Just love them. The colors would be perfect for some pillows for my sewing/office area. I really love the bold patterns of this line. If I won the layer cake, it would be turned into Christmas gifts of iPad covers and wristlets. But I would use that scisors fabric to make some needle cases for myslef and quilter friends. This fabric would be PERFECT for my Japanese paper-pieced butterfly quilt! Thanks for the chance! I am following the Moda Cutting Table blog as well as the Sew4Home blog and have been for awhile now. I left a comment at the awesome curtain tutorial today over at Sew4Home. Beautiful curtains. I love the aqua paisley fabric. If I won, I would make some things for my sewing room. My sewing machine and serger both need a cover and also a printer I don’t use often to keep the dust off of that as well. WOW!! pretty much sums up that fabric line-since red is my favorite color that one really jumped out at me! My creative juices are working over time at what I might make from a layer cake-from curtains to tote bags to throw to maybe a table topper!! Boy would I just love Santa to put that layer cake in my stocking!! This would be a fun layer cake to make a project from. Santa I’d like this one too. Fabulous fabric I would love to get my hands on that layer cake. ooohhh! Lots of fun fabrics in here!! Pick me, Santa! SANTA,I THINK I’D LIKE TO MAKE SOME NEW TABLE ITEMS FOR US,LIKE A RUNNER+PLACE MATS TOO; SO I NEED YOU TO FILL MY STOCKING WITH THIS COLLECTION! i’m one of your happy followers! Wow those curtains are fabulous. If I found this layer cake in my stocking I would use it to make co-ordinated sewing accessories a – journal cover, tote bag, pin cushion, needle case, scissor case etc. i’d make a table topper for a christmas gift … this is a great colloection. This is the best one yet!!!! I would make the curtains from sew4home and a sewing machine cover and a skirt for my sewing table and…..
Definitely a sewing machine cover! I hope when Santa flies over the Half Moon he will see my request to win this week! What great fabric! a beautiful new range……….I haven’t seen before……..lovely and bright………. i would love Santa to drop this in my stocking…a fantastic line with a modern appeal. Thanks! I would love to win a layer cake of Half Moon Modern – the colors are bright and cheerful. I get Sew4Home’s newsletter & I’m a follower here. Thanks for the chance to win. I’ve tried charms but never a layer cake. Thanks for a chance. I would love to use the layer cakes to make a cuddle quilt for a friend! I would love to win this as I would make something from it for a friend. Love the fabric. Beautiful fabric, and those were beautiful curtains, something to make with those fabric, out of the box. I absolutely love these curtains and I have the perfect window for them. So, I need to win! The collection is way too too cool. This half moon fabric is lovely – I plan to make some sewing accesories and this fabric would be beautiful to use. Oooh, love the scissors and the dots and, oh, just about everything else in this line! Please Santa? This fabric would be just perfect for new curtains in my sewing room. Love the fabric, can’t decide between the kitchen or the sewing room. Place mats or sewing organizers. love this fabric, it would make a great quilt to snuggle under over christmas. I loved this collection. I am looking forward to all the homely projects being presented at Sew4Home. I would love to make a cover for the outside TV screen. The fabric is very nice!! Sew4Home has some great projects! Love this new fabric, it would be just perfect for a quilt for my granddaughter’s new “big girl” room. I’m a follower and I left my love. I not only what this “layer” cake, but I want Santa to bring me a chocolate cake too. Can you tell I’m hungry. That’s my natural state. The fabric certainly is an incentive to make my sewing room more attractive for accomplishing my sewing and quilting projects. I am such a HUGE MoMo fan. (And Sanae.) And bright primary colors. This collection was made just for me. because last year santa left me NOTHING in my stocking…i know, it’s true! If I won this layer cake, I’d make myself a throw pillow or two! Beautiful. I gave Sew4Home some love! I’d have to make a fun quilt/throw with that! I want Santa to bring me this layer cake of Half Moon Modern Fabrics so that I can make some mug rugs and hone my quilting skills. I am a novice and would love to have some fine fabric to play with! I would use this layer cake as the inspiration for my next quilt. Beautiful fabric! I would use the layer cake to make a cover for the gorgeous antique Singer sewing machine I found recently! There are so many projects I could do with this fabric. I don’t know which one to pick. I plan on redoing my sewing room in the spring and this fabric could only help. who says you can’t have your layor cake and eat it too! I would bake something up nice with that. I’d use the half moon for a quilt for my grandaughter. I would like Santa to leave me anything to do do with quilting. Other than Santa, no one else will. I will make a table runner for a Christmas present. I love this fabric and would love to have some to make a twister quilt. This selection would look great anywhere, but especially in my sewing room. Thanks. Santa MUST bring me this layer cake!! I’m sure he knows how much I love new fabrics. What to make? Hmmm, zipper pouches, cosmetic bags, cell phone cases. That would be a great start. I’d definitely use this in the new baby’s room somehow. I want Santa to leave me this because I have several project I want to make but no $$ for fabric. Thanks for the chance. This fabric is not something I would normally choose but I really like it. Especially the beautiful paisley print. Think I would make cute little bags for the girls. Thanks! Loved the projects over at Sew4home. I would use this fabric to make a tote bag & some pinkeeps for friends. I love Momo. I think I would make Dot Party by Jay Bird Quilts. What a nice fabric line! I promise I would make a sewing machine cover out of it, so there wont be any dust on my machine any more. Wow! A cake with no calories and no weight gain! I need this in my stocking! Love the colors and all various patterns of the fabrics. I would love to make a kids or beach throw with this fun and happy fabric! I can always use more fabric! OOOO, I really love the scissors fabric. I’d love this layer cake in my stocking.!! Oh – I NEED this fabric! I love butterfly patterns! I love working with layer cakes! I have made a number of projects with them and would love to make another with this fabric. It is sew much fun! These fabrics would make a great purse. I think I’ll make table runners….all my friends love them. Half Moon is such a fun group. My sewing room needs a quilt, so I can handsew in comfort. Love the scissors print! I want Santa to leave this in my stocking because I need some new fabric to play with! Very nice fabric designs. I think I’d use it to make sewing accessories for my sewing room. I am addicted to layer cakes and I would sew use this one up fast!! I have always loved layer cakes, I would make a lap quilt. Santa should put this under my tree, because, it would make a great quilt for my newest Grandniece (due in April), she would look great wraped up in this fabric. Dear Santa Mama Moda, Please slip this layer cake into my stocking. My 80 yo mother loves the aqua color and this would make a wonderful quilt for her. She always makes others quilts, and I’d like to make one for her … or maybe figure out a way to make her a curtain. I’m enrolled with sew4home and love the curtain made with this fabric. So pretty please, Santa Mama Moda, leave this for me (a follower). I am also a follower of yours and Sew4home. I love this collection! If Santa left it in my stocking, I would make a new cushion for my sewing stool and a new cover for my machine! With this layercake, I would make come pillow covers. Thanks for the give away. Free fabric – what could be better?? AND my sewing room needs an updated look – right now it’s retro teen since I took over my daughter’s old room. Coordinated curtains, ironing board cover, scrap bag, pincushions – the list goes on and on! LOL! And I LOVE Sew4Home! There are so many great projects for Moda layer cakes. I would love to win this gorgeous oone! Love these fabrics! Well, for certain, should I win, I will be using them to make Christmas presents. Pillows are quick and easy by creating one quilt block with a coordinated backing. Have a blessed day! I think those fabrics are adorable! I would also make a quilt, something that would hi-light those awesome prints. this layer cake would make a dynamite quilt to snuggle under in my sewing room – hope I win! Love the colors–I would make some small coin bags for gifts. Or a nice throw. Thanks for the introduction to Sew4Home. What fun projects! My new young DIL would be so excited to come sew with me if I had a Half Moon Layer Cake sitting around. I can just imagine the fun little bags we could make. My sewing room could definitely use a make over. This would be a great start. These are MY colors! Bold, bright, perfect for a nice lap quilt. Thanks for the chance to win one of your great products!!! Would love to make a new bag from this pack. They have some beautiful projects on Sew4Home! I would love to use the fabric to make some curtains for my Kitchen window! I’m wanting to make some new placemats! Thanks for the chance to win. I would make a quilt for my new grandson. Very nice fabric. Santa knows you just can’t have too much fabric! I love Sew4Home. Anne and Liz are so great and they do amazing work! I think I’d make some wonky log cabin blocks out of the layer cake. I love the scissor print! oh wow! how cool. I’ve always wanted to play with a layer cake! I would love this fabric in my stocking. It would work great with another layer cake I have. I know a great pattern that uses a layer cake. And the scissors fabric is just so funky, I love it! Thanks for the great giveaway. I think I would use the fabric for a cute wall hanging to hang by my sewing machine. I left some love over at Sew4Home! and I would love for Santa to bring me this Stocking Stuffer because the design looks like something I could use to make my daughter a table topper. I love this fabric. I also enjoy Sew4Home. Be a beginner I have learned so much from their site and made several things!!! I am buying a home for the holidays. It will need to be decorated from top to bottom with cute nifty things… this fabric will work perfectly in the sewing room!! Love Half Moon Modern. I think I might make some traditional blocks with it and some other modern fabrics from my stash…or I could make…..
Love this fabric. I would probably make a Schnibbles quilt with this fabric, so I hope Santa will bring it to me! I love this fabric line and those curtains were great. I need this layer Cake! I have been on a diet and have not had any cake of any kind!!! It would be such a treat!!! And I love it!!! I love this fabric!!! I need the cake!!! I have been on a diet and have not had any cake of any kind! My sweet tooth and my stash are going crazy!!! Help me!!! The fabric is yummy! Who wouldn’t like that in their stocking this year? I just saw the curtains when I was at their site. I get their newsletter, love seeing what they create. Beautiful fabric and if Santa bought me some, I could make a beautiful quilt with it. If Santa brought me that layer cake, it’d be made into a quilt JUSt FOR ME!!!! Yum! Looks like a luscious layer cake! I wish Santa would bring me a rotary cutting tool and mat. I really need those….Fabric would also be good…I’d make rag quilts for my kids. Would love to find this layer cake in my Stocking! Yummy! Sew4Home is wonderful. I would totally make a quilt with this fabric. these would make great stockings! I’d love the half moon layer cake because I’d love to make placemats so I could see the fabric all the time! I would do a fun wall-hanging quilt for my sewing room, then make a pincushion (or 2!) out of the scraps. I love Sew4Home and are a long time subscriber, they’re just awesome! And this 12 days of Christmas giveaway is fantastic! I love these fabrics & would be so happy to find them in my Christmas stocking. I’d love to make a quilt & some gorgeous pillows with them. Thanks for a fab giveaway! Love this fabric, the scissors are so sweet! I would love to have this because I have been a good girl and I haven’t bought any fabric “on spec” for a very long time. I just found a new pattern I am dying to try. This fabric would be PERFECT! Thanks! First, thank you for introducing me to Sew4Home. They have some really neat ideas that I would love to make, and the material they used in the curtains was very pretty, especially in my favorite color. I would love the win the layer cake. The cut is a great, easy one to use, and it gives a preview of the fabic that will help me decide which to buy! heading over to sew4home.com right now to see their projects, i loved the half apron with all the pockets will make great gifts. I love these cheery bright prints. Also layer cakes help feed my addiction to the Twister tool! Santa is only visiting kids here this year so I’d love a little stocking stuffer! sewing rooms are the best room in the house. Love this modern fabric…so fresh! Santa’s layer cakes are the best kind! Love the scissor print bunches. Darn it, missed the giveaway ! Late to the hop but I love this Half Moon collection. I don’t need curtains but I’d love it in a quilt. Sew4Home is a fantastic site I’ve followed for awhile, SO much inspiration ! ooooh this is super cute fabric! I would love to add these to a quilt I am making! Wow…sorry I missed this one! This would have been great to win! I want this because, well, because it is fabric! Love the whole home theme! The layer cake could brighten up a corner of a kitchen! Love it all!!! 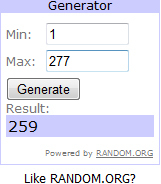 Leaving a comment to win the Accuquilt GO! Such beautiful fabric. Lucky winner. I’ve been following along at Sew4Home this past week watching all the adorable sewing room projects they’ve been creating with this fabric. Now I MUST have some Half Moon Modern fabrics of my own. This fabric is stunning – love it!! Thanks Moda for this fun time. 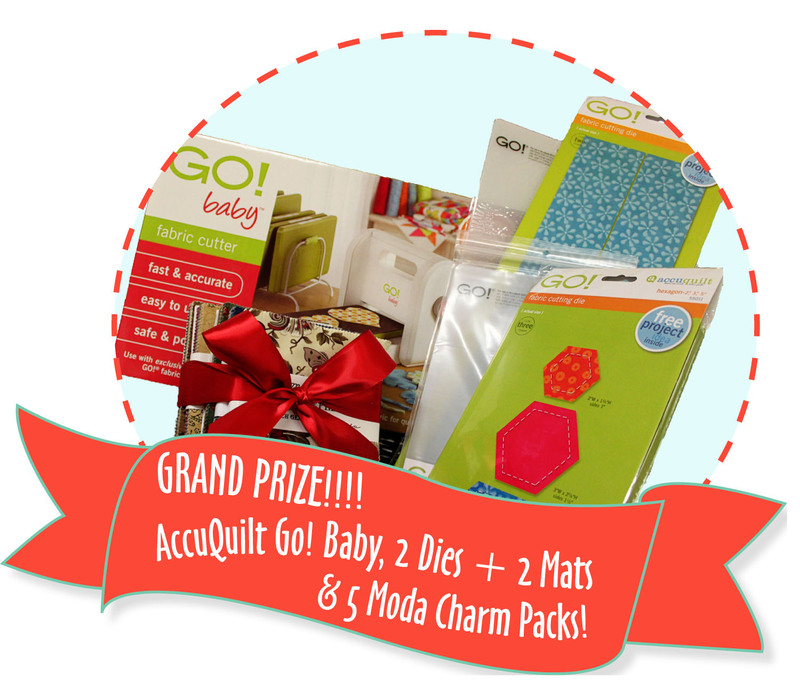 Accuquilt Baby Go, come to Momma!! !